We’d all just turned off our headlamps and could see the peaks take shape in the distance. The landscape came into focus: tufts of green grass turning to gray and brown scree as the trail climbed upward. At just under 13,000 feet, we were well above the tree line. A tall, fit man appeared over the rise, descending from the summit. We’d been hiking for about an hour, but it was still only 6:15am. If he was already descending the 14,148-foot peak, he must have started his hike hours earlier. “Did you make the summit?” asked our leader, Nick. “No, I turned around. Crazy amount of lightning in the distance,” he said, before making his way to the trail-head below. I flew into Colorado on Wednesday, August 15, joining six people I’d never met for four days of workshops, practice hikes, and altitude acclimatization. But I already knew John liked cycling, Mary struggled to get enough sleep, and Liane was in the midst of a couch-to-5K program. I’m not a social media stalker—all of us spent the previous six weeks as a team participating in the Whole Life Challenge, logging our scores and sharing our daily reflections. Nick Hemmert, founder of The Center for Awesomeness—a team building and leadership development organization—had brought together this unlikely group of people from California, Ohio, Minnesota, Massachusetts, and Colorado. Nick is familiar with the power of climbing mountains. He’s summited 38 of Colorado’s 53 14ers, and says each ascent helped him gain a new perspective, gave him increased confidence, and provided him with the will to achieve new goals. Joining Nick in organizing the event was Anna. When Anna’s husband Jason died in a hiking accident in 2015, she was six months pregnant. As a widow and a young mother, she made a decision to fight through the grief and pain and live a life of love and happiness with her daughter. Anna summited her first 14er in 2016 in honor of her late husband, and this second ascent on August 18, 2018 would coincide with her 37th birthday, marking the day she lived longer than her husband, who died at age 36. Nick had led a previous group to the top of a 14er, but felt some in the group weren’t physically or mentally prepared for the rigorous climb. He thought the Whole Life Challenge would be a great way to give our group the motivation and structure we’d need to succeed at the ascent, while helping all of us improve our health and wellness. The ascent wasn’t until Saturday, so we had two full days to go on practice hikes, reflect on the Whole Life Challenge, and think about the ascent and what we hoped to gain from the experience. We unpacked and settled into a rental house in Keystone, appropriately located in Summit County, Colorado. 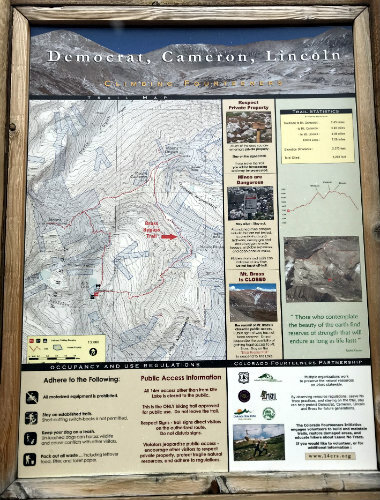 Over coffee and on trails surrounded by aspen, lodgepole pines, and dots of bright wildflowers, I learned what brought my fellow participants John, Mary, Tom, and Liane to both the Whole Life Challenge and the mountain. Like our co-organizer Anna, John and Mary had both suffered soul-shattering losses. When John’s wife died of cancer five years ago, he was left to care for his three daughters, the youngest only twelve at the time. Mary had taken care of her sick husband and endured overwhelming grief when he died after a battle with cancer. Tom, Mary’s father, was witness to this. Liane’s marriage was ending, and she was facing life as a single mother of a four-year-old boy. Everyone in the group knew the importance of healthy habits when dealing with loss and grief, and each was determined to find happiness and joy while remembering and honoring what they’d lost. One night after dinner we talked about how the Whole Life Challenge helped prepare us for the hike and the daily challenge of building healthy new habits. Anna described what she called her “imperfect dedication” to the six weeks of the Challenge. “I didn’t always log in, but I was always focused on my goal of getting off my anxiety medication,” Anna said. After the birth of her daughter, newly widowed and a single mother dealing with sleep deprivation and grieving the loss of her husband, Anna’s doctors prescribed her anti-anxiety medicine. In the last year, Anna had set a goal of going completely off her medication by focusing on nutrition, sleep, exercise, and meditation. The Whole Life Challenge helped her reach this goal. “I’m doing this hike medication free,” Anna said proudly. Mary’s motivation during the Challenge was the knowledge that the rest of the group was following the 7 Daily Habits and diligently logging their scores. At first, Mary said she logged her score every night because she felt accountable to the group. “Then I was doing it because I felt better. I was doing it for me, because it made me feel better,” she said. 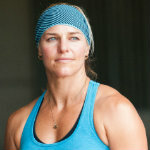 Liane said the Challenge helped her make fitness a priority. The 14er was on her mind constantly during the six weeks. “I don’t want to die on this mountain,” she said about the hike as motivation. Soon she discovered paying attention to her sleep, nutrition, exercise, and well-being helped with the chaos of her personal life. One moment in particular during the Challenge stuck out for John. He had a craving for ice cream, but knew he needed to log some miles to prepare for the hike. So, in a moment of inspiration, John decided to earn his ice cream. He shouldered his backpack and walked eight miles to his favorite ice cream shop. The time together before the hike allowed the group to adjust to the altitude, get to know each other, and ease into the challenge with several practice hikes, but it also ratcheted up the anticipation of what was to come. Anna bought large, stick-on glitter letters and made a sign for each peak we hoped to ascend: Mt. Lincoln, 14,286 feet; Mt. Democrat 14,148 feet; and Mt. Cameron, 14,238 feet. She also made a sign with the date of the hike, her birthday: 8-18-18. We talked about what the hike would mean for us all, how this ascent might help us rise above everything we’d faced in the last year. Mary talked about how, on a recent trip to Italy, she’d climbed a volcano. Halfway through the hike the group stopped. Mary was feeling great and eager to continue, but the Italian guide turned to look at her. His doubt caused Mary to falter, and then it made her angry. She ignored him and hiked to the top of the volcano, but the guide’s words stayed in her head. She wanted to climb a mountain and silence those doubts, proving her strength to herself. By 8:00pm Friday night, our backpacks were packed, our hydration bladders filled with water, and our alarms set for a 3:00am wake-up. Before our evening meditation, Nick directed us to write an emergency contact and any medical issues on a piece of paper and put it in our backpacks. Just in case. That’s when Nick gave us the pep talk, bringing up lightning as a quick aside. As a southern California native, the idea of lightning in August seemed ridiculous to me, just as much an over-precaution as the emergency contact numbers in our packs. I was anxious to get to sleep right away, but instead lay awake for hours, drifting into a light sleep for an hour or two, glancing at my phone as the hours passed. 12:00am. 1:00am. 2:00am. We made the one hour twenty minute drive to the trail-head in the dark, climbing higher and higher on twisted mountain roads. Then the pavement ended, turning into a rutted dirt road, and we bounced around in the car for the last eight miles. “Well, if you didn’t have to go to the bathroom, now you do,” said John, sitting next to me in the back seat. The parking lot was full even at 5:00am and we could see pinpoints of light moving slowly up above—headlamps of hikers who’d gotten an even earlier start. Joining our group of Whole Life Challenge participants were two women from Colorado, Sally and Stephanie. Nick would take the lead, and Sally and Stephanie would head up the groups that formed based on our pace up the mountain. The path grew steep almost immediately. Hiking uphill at 12,000 feet is disconcerting. After a few steps, my breathing grew rapid, and I fought to remain calm. We could only see what was illuminated by our headlamps, so we kept moving forward, taking frequent breaks in the darkness to catch our breath and sip water. The sky grew brighter, and one by one we turned off our headlamps. Then after about an hour of hiking, we saw the man coming down the mountain. He gave us his lightning report and repeated it to the people farther back on the trail. Anna’s voice crackled through the walkie-talkie with a question for Nick. “Do you think the lightning will keep us from summiting?” she asked. “I don’t know,” he replied tersely. None of us knew, so we kept hiking. After another hour of slow uphill progress, the group reconvened when we reached the saddle, with Lincoln and Democrat on one side, Cameron in between. At 13,900 feet, we still had almost 1,000 feet more to go. It was almost 8:00am and dark clouds shrouded Lincoln and Democrat to the west. Nick made the decision to go for Lincoln and Cameron to the East, hoping to avoid the storm. Nick picked up his pace. Tom and I followed in his footsteps. The trail grew steeper, my thighs burning after only a few steps. Then the sky turned dark, clouds gathering overhead. We walked for about ten minutes until it started to rain. I reached into my backpack and took a plastic poncho out of a small Ziploc bag. The wind gusts whipped it around my head, threatening to tear it out of my hands. I gave up and stuffed the poncho into my backpack. Nick looked at the sky, then at the trail ahead. “Let’s turn around,” he said. My heart sank. We’d reached 13,800 feet, so close to the 14,238-foot peak. I thought about Anna and her signs, Mary and her determination to prove that Italian guide wrong, and Liane’s newfound dedication to healthy living. I remembered John had used the ascent to raise $3,000 for a Gold Star widow. And I felt my own disappointment, at the pleasure I derived from pushing myself physically to reach a goal. We followed Nick down to the saddle, meeting the rest of the group in front of a small rocky hill we’d dubbed “Pee Mountain,” after its usefulness as a mountain toilet for the women in the group. Anna got out her “8-18-18” sign, and we asked a passing hiker to take a photo of our group in front of Pee Mountain, the only summit we’d reach that day. We began our descent around 8:30am, a little over three hours after we’d started hiking. On the way down, I had time to think about not reaching the summit. Every person in the group said they felt strong, physically and mentally, and knew they could have continued if it weren’t for the very real threat of lightning at the top. The Whole Life Challenge had prepared us well. Nick said later the difference between this ascent and the previous 14er ascent he’d led, without the Whole Life Challenge as preparation, was the six weeks of structure and accountability. He had six weeks to check in with the group, to remind us to hike, to get in our squats, to focus on sleep. “Everybody was prepared and confident,” he said. I wrestled with my disappointment as we descended. Why were those extra 438 feet so important to me? As a goal-oriented person, I often struggle to enjoy the journey, instead fixating on the destination. Over the last six weeks, I’d completed the Whole Life Challenge, connected with a group of people who inspired me with their love and humor in the face of devastating loss, and challenged myself physically. I thought about how wellness is a lifetime pursuit. That while we may reach the end of any given Whole Life Challenge, we never actually reach the end of the 7 Daily Habits. Healthy living is a journey, not a destination. True wellness is not achieved through restrictive, short-term diets or exercise routines too grim, or too boring, to maintain. True wellness is not one moment in time or a singular achievement. Success is when a healthy habit becomes as routine as breathing and lasts for years. Then I remembered what Nick had said in the dark that morning at the trail-head, when our group had gathered in a circle before heading up the mountain. To learn more about the work Nick, Anna, and their team do — and how they can organize a summit for your team or organization — visit The Center for Awesomeness.